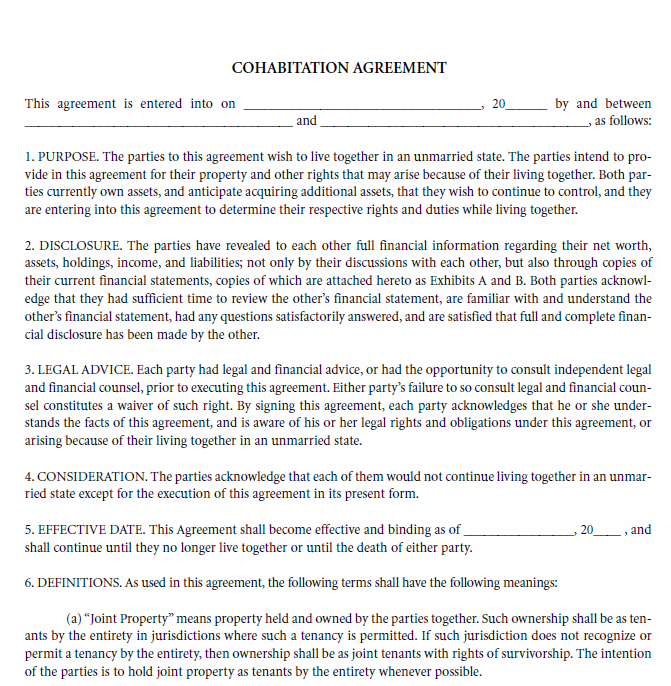 This is a Cohabitation Agreement Template, it should be applicable in all states, yet it is advisable to consult an attorney. This is an agreement between two parties, who wish to live together in an unmarried state. This Agreement is so that the parties living together can still control their own assets individually. Download this agreement by clicking on the download link at the bottom of this page. That both these parties mentioned in this agreement are agreeing to live together in an unmarried state and they are making this agreement to control their individual assets themselves. Both these parties have disclosed to each other complete financial information regarding their net worth, assets, Holdings, income and liabilities through copies of their financial statements. These copies need to be attached with this agreement at the time of signing. The effective date of this agreement has to be fixed and that this agreement will continue to be in effect until either or both or any one of the party does not want to live together anymore or in case of death of either party. Joint property means property that is owned by both these parties together and both parties will carry ownership rights on this property together. Separate property means property that is owned the by each party individually and the other party has no right of ownership or this property. Both the parties agree that either of them can acquire property during the time they are living together and the ownership of this property will be determined by which party paid for that property. If both of both the parties funded for the property then it shall be deemed as a joint property or if anyone of the parties paid for it that shall remain separate property of that particular party. In the case of separation of the parties both of them agree that this cohabitation agreement will govern all the rights to property, property settlement, rights of community property and equitable distribution. Both the parties will waive the right to be supported by each other after their separation or after the death of either party. The rest of this agreement details out the terms and conditions relating to beneficiaries, severability, free and voluntary acts, attorney’s fees and enforcement and signatures and initials of the parties. Both the parties must sign the document and the gated notary by a Notary Public, only after which will this agreement be considered legal invalid.